Aahhh… summer! 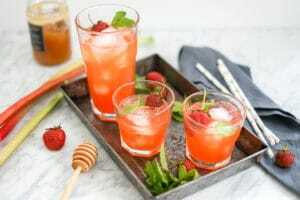 For everyone gearing up for long weekends, barbecue season and vacation, here’s a delicious and refreshing recipe for an Old Fashioned Strawberry Rhubarb Pink Lemonade, minus all the yucky refined sugar and high fructose corn syrup that is usually found in so many commercial versions. This recipe requires a bit of work, but minimal, and it truly feels like an old fashioned lemonade that you could find in the country farmhouse during a simpler time. There’s just something about it. This also makes a very large pitcher, so you’ll have plenty left for a few days. I used some raw organic honey from a local hive because raw honey has some additional health benefits on top of feeling very “old fashioned” and homey, but you could replace it with maple syrup if you wish. 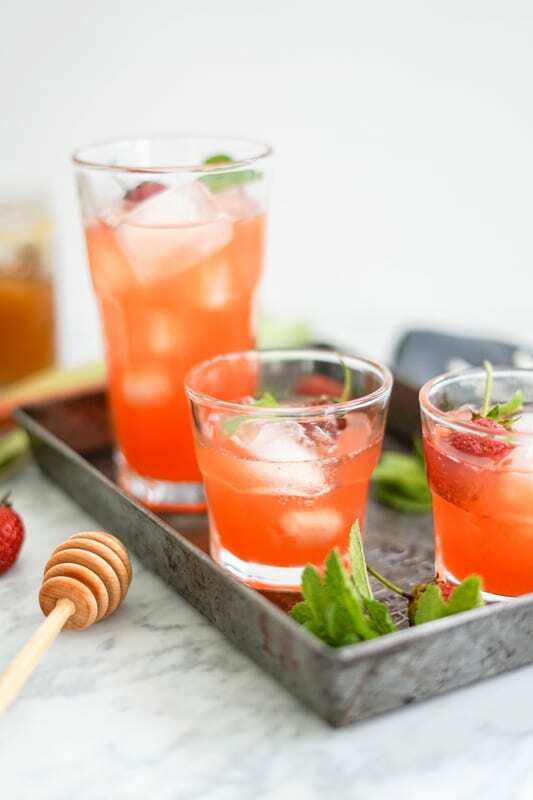 If you’d like a quick lemonade recipe, check out this Strawberry Mint Lemonade! A delicious and healthy way to drink something refreshing in the summer with this Old Fashioned Strawberry Rhubarb Pink Lemonade recipe. Refined Sugar-Free. Try to look for organic strawberries to minimize your exposure to pesticides. In a medium-sized pot over medium heat, put 2 cups water with the prepared rhubarb and strawberries. Bring to a boil, then reduce to low heat, cover and cook for 5 minutes. Turn the heat off, mix in the honey, and let sit for 5 more minutes. 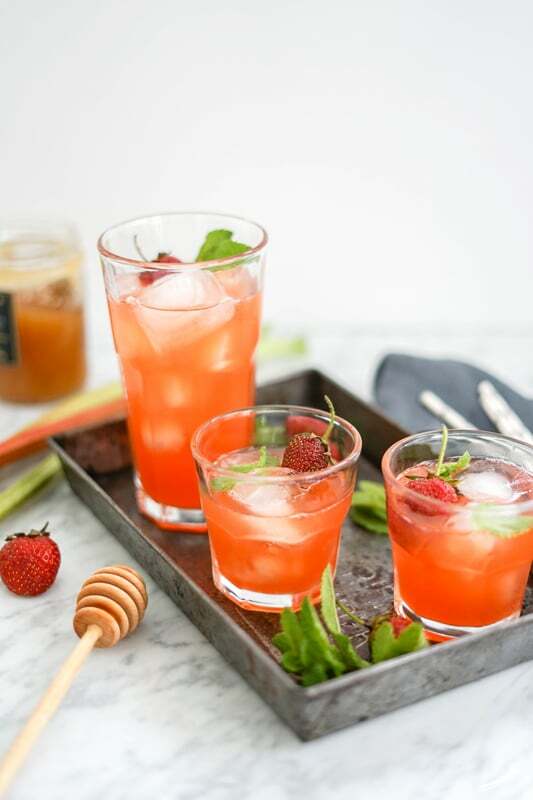 Pour everything in a strainer over a large bowl and, using a spoon, crush the rhubarb and strawberries to get as much juice out as possible. 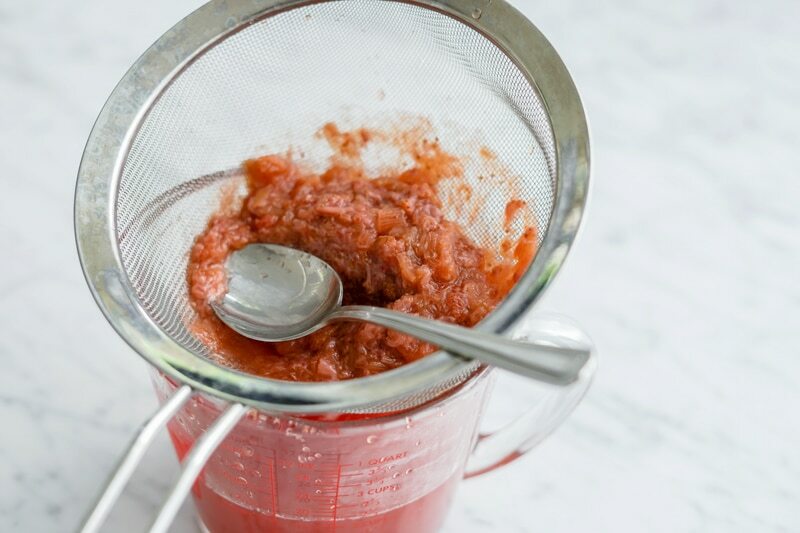 If you wish, put cooked strawberry rhubarb mixture in a blender first, and then through the sieve, to get as much out as possible. Add the lemon juice and the rest of the water, mix well and put in the fridge to cool for a couple of hours. Serve cold. Enjoy! Keep in the fridge in an airtight container, like a big mason jar, for up to 8 days. 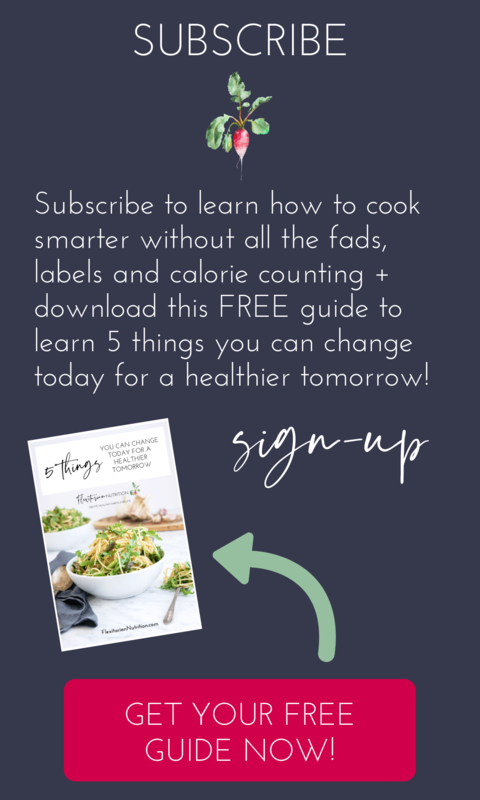 Don’t throw the leftover pulp out! Add a bit of maple syrup in, and eat it on toast, it’s delicious! Thanks! 🙂 It’s well worth the little bit of time to prepare it! One more way to eat rhubarb! Andt the leftover pulp will be great in a smoothie, too! What a refreshing twist on lemonade! It may be old fashioned, but I’ve never had it before. I think it will be a great summertime beverage! As you probably know, I’m not a fan of sugar, so this looks perfect. Ha! 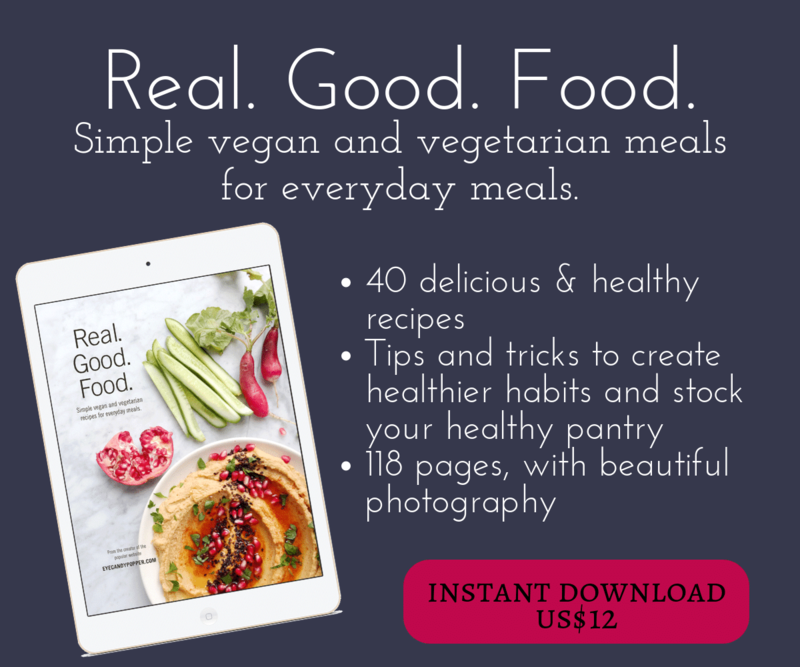 I’m like Isabelle – I was thinking this was such a versatile recipe because it works for everyone (kids and adults!). And yes, a little bit more work but so worth it! 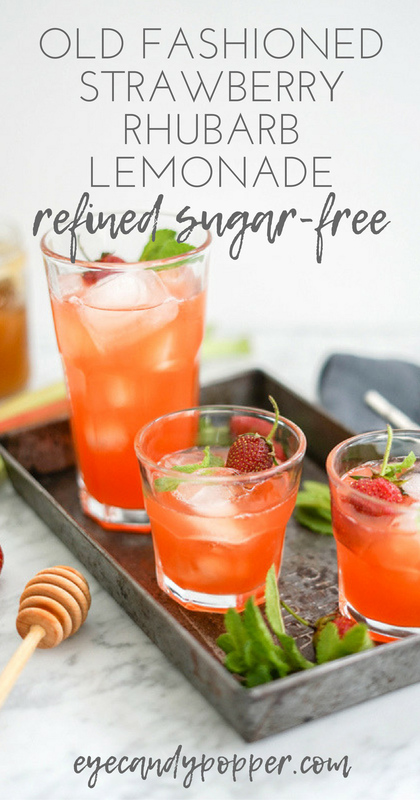 This is right up my alley — I love naturally sweetened, better for you summer refreshments! I think you mentioned this was a reshoot and the photos are absolutely stunning. I also love your tip about making use of the pulp. And I second Isabelle’s comment — I bet it would be lovely with a splash of gin!